Just a few miles outside of town sits the lovely Bavarian town of Mount Angel. At the Glockenspiel Restaurant, local ingredients from less than a mile away, are the emphasis. That makes the entrees served taste a lot fresher and really brings something special to the table. Besides the tried and true German recipes like wienerschnitzel, I urge you to try their special cabbage, which takes the chef five hours to make. It will tantalize your palate. 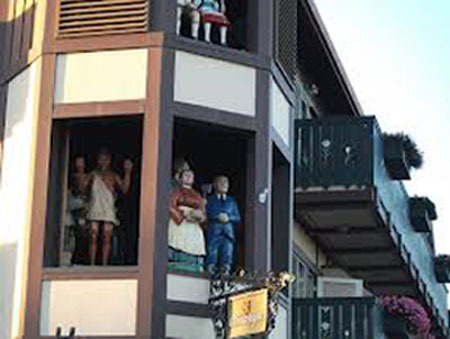 Then at the appointed time, go outside and watch the performance of the wooden dolls in the Glockenspiel tower alongside the restaurant. For a healthy walk after dinner, head up to Mount Angel Abbey. Enjoy the gardens and the peacefulness. Mount Angel’s largest claim to fame and what the townspeople put the most energy into is their Oktoberfest. This year is the 45th annual and runs from September 13-16. With all kinds of fun for the whole family, Oktoberfest celebrates the harvest and the bounty of the earth through live music, street dancing, a car show and more. 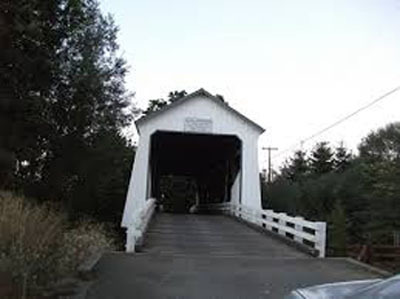 On the way back to Salem, visit the Gallon House Covered Bridge, Oregon’s oldest covered bridge. It was named for the days when liquor was sold by the gallon or quart in a nearby house. Gerry Frank’s Konditorei, with more than 40 flavors of cake and pastries, is a must-stop for dessert in Salem. Local favorite cakes include Barney’s Blackout, Chocolate Raspberry and Lemon Cream. I savored the seasonal Marionberry and highly recommend it. Then for $1.50 you can’t beat the price for a ride on the old world-style carousel housed in a stately building on the banks of the Willamette River. This entry was posted in Fairs and Festivals, Family Fun, Gardens, Oregon, Restaurants, Seasonal, Sweet Treats, Towns and tagged cabbage, carousel, covered bridge, Gerry Frank's Konditorei, Glockenspiel Restaurant, Mount Angel, Oregon, Oregon State Fair, Salem, wienerschnitzel on August 30, 2012 by admin.